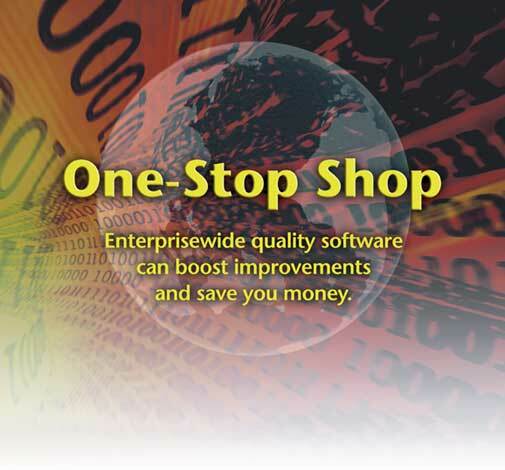 Enterprisewide quality software systems represent the next generation of business management software tools. Why? Because they're designed to make companies run efficiently in a highly competitive global marketplace. Enterprisewide software will revolutionize business and lead to enormous savings by reducing redundant data entry while improving information management companywide--without costly application software and hardware infrastructures at every site and office. Consider the quality-related software products on the market today. Literally hundreds are available that support only one function, such as documentation, calibration or SPC. In addition, because these single-application products are usually workstation or LAN/WAN-based, companies interested in using them usually must purchase one package for each of their locations. Although a few packages boast a wide variety of functions, most of them focus strictly on product quality and neglect business systems. What's missing from these packages are tools for customer focus, business objectives, organizational improvement, process maps, business process flows, process measurement, data analysis, data availability and teams. These can all be classified as the customer focus and/or objectives setting, which includes process focus, data analysis and continual improvement. The second major problem area with most software packages involves integrating the individual site(s) and the organization as a whole. How are documents shared between sites? How are data rolled up from departments to sites to business units and finally aggregated at the corporate level? For the most part, these packages are site- rather than enterprise-oriented. Their developers might not have considered the entire enterprise when designing the software. Documentation or data analysis might only be available on a site-by-site basis. Needless to say, sharing information and linking functions between sites and even discrete business units within any organization is critical. Enterprisewide software allows an entire system to be installed in one place and on one server. Whether it's used for audit administration, document management or process analysis and improvement, the software can support one site or 100--it isn't constrained by a LAN or site-specific requirements. Enterprisewide software isn't about duplicating the functions of one site at 100 others but rather addressing the complexities of how information, resources and data can be shared between sites and managed either centrally or at various "nodes" within the organization. What's the difference between documentation software designed for one site vs. an entire enterprise? Site documentation takes into account the documentation structure of that site alone--a specific quality manual, procedures, work instructions and forms and checklists. Even if the software has been flexibly designed for multiple levels, it doesn't address the entire organization's needs. How does enterprisewide software handle this? Typically, one quality manual is shared by all sites, even though two procedural levels exist--common and site-specific. Enterprisewide software provides the flexibility to design documentation at, say, site No. 100 that incorporates separate documentation from all or none of the other 99 sites. It provides standardized document control and consistent naming and/or numbering conventions for documents and records throughout the organization. It allows site No. 100 the flexibility of maintaining its own levels of documents. This includes the ability to establish a naming convention for its levels, borrow all or none of the documentation from other levels and create documentation. In contrast, site-specific documentation software must be individually installed at each of the 100 sites. At most, the site packages can talk to each other if they're based on Lotus Notes or other groupware, and allow users to update specific common documents. More often than not, such software is mutually dependent and requires workstation application software to support it, whereas enterprisewide software is accessible through a Web browser already available at most workstations. However, the fact that software is Web-based doesn't guarantee it's also enterprise-oriented. One Web-based documentation software vendor told our company that all documents could be used and/or accessed by all the sites if we purchased individual Web-based packages for each site. When we explained that only some of the documents would be shared by each of the sites, the vendor suggested we install its package at each site. In other words, the typical site package allows all sites access to all documents or each site access to its own independent set of documents, but neither option provides the flexibility and integration of a true Web-based enterprisewide system. How would a site-specific auditing package function? It would focus on one task (e.g., internal audits for one standard). Enterprisewide software, by contrast, would typically consider that individual sites might apply for different standards. For example, in large organizations, some sites might be ISO 9001:2000-registered, others QS-9000-registered, and still others might be upgrading to ISO/TS 16949:2002 while also implementing ISO 14000 and conducting safety and health compliance audits. Enterprisewide software can handle the complexity of multiple standards, checklists and audits. In fact, it can support internal system, process, product, safety, environmental and financial audits in one package. It can also handle ISO 9001:1994, ISO 9001:2000, ISO 14000, QS-9000 and supplier audits all in one package. Additionally, the software can share auditors, audits and schedules between sites. An organization's business success dictates that its enterprisewide software focus on more than product quality and quality management systems documentation. Packages that focus primarily on these are easy to spot. One popular enterprise vendor's modules offer the following: documents, training, control plans and/or FMEAs, maintenance, calibration, inspection data, supplier management and auditing. Another vendor provides these modules: documents, audits, corrective action and quality records, including training, calibration, customer complaints, engineering change and design review. Any package that doesn't address customer needs and expectations, organizational objectives, objectives deployment, performance measurement, customer satisfaction, continuous improvement and business processes--and neither of these packages do--isn't focused on the business. 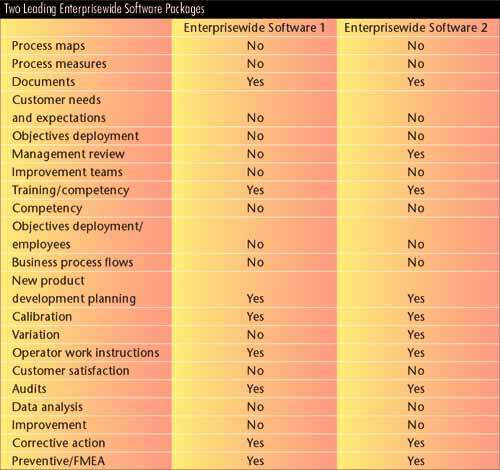 From this matrix, it's clear that two leading enterprisewide software packages don't have a business or ISO 9001:2000 focus. That's because many packages were designed for ISO 9001:1994 and its now-outdated element structure and product-quality focus (i.e., inspection and product measurement). A critical element of enterprisewide software is its link between modules and functions. At a minimum, there should be links between customer expectations, objectives, processes and process measurables. Other links exist be-tween customer expectations, company objectives, personal objectives, teams and continual improvement. This is a natural extension of the previous alignment between what customers want and how an organization establishes its objectives, performance measurements and data analysis. Finally, these objectives must be deployed to employees and linked to actual process or result measurables. This also supports a much more objective employee performance appraisal process. How do organizations and/or departments accomplish these objectives? To close the gap between measurables and goals, organizations create teams and use such tools as 8-D, action plans and meeting minutes to drive improvements. Software should help this process along. Still other links exist between products, new product development, FMEAs, control plans, and work and/or process instructions. Effective organizations use these tools to launch new products and improve all their key business processes. Software should help facilitate this. Other links exist between products, gages, gage control and calibration, and measurement systems analysis. Product and process control require gages for inspection and testing. Before use, inspection and test equipment must be calibrated and measurement system variability studied and reduced. This link must be defined and managed for both existing and new products. Finally, a very important link for business-oriented software exists between process maps, flows, measurables, analysis and improvement. Process maps display an organization's overall process structure. Each of the processes in the map can be flowed to describe its activities, responsibilities, inputs, outputs, characteristics and acceptance criteria. By using process maps and flows, processes can be measured and improved. One of the key requirements for an enterprisewide software system is document access for relevant employees. Such accessibility shouldn't be confined to offices or sites. In today's business environment, employees must be able to access information and documents on the road--when visiting customers or suppliers, for example. And this isn't simply about viewing Web-enabled documents; it's also about making transactions and conducting business while traveling. One of the prerequisites of a good enterprisewide system is that it's "all Web," not just Web-enabled. Ideally, users should only need to use a Web browser to do their work. Effective software is also flexible enough to handle documentation in any format, including the one the organization currently uses, if appropriate. The company shouldn't have to convert or retype documents to accommodate the system's requirements. The software can provide one level of documentation, or fifteen, to suit the organization. Users can instantly route document changes to anyone in the organization. Review and approval routings are automated as appropriate: If the organization requires that one person review all level one documents, for instance, then the software will automatically route documents to that person last without having to input his or her name every time a change requires approval. Viewing documents should be like opening a book with a prominent, easy-to-use table of contents. With enterprisewide software, links are built in to navigate easily between levels and documents. The software allows users to view the status of documents in the change process, as well as a document's change history. It also provides automatic notification via e-mail to the people in a given routing for all documents waiting for change. It continues notifications at a user-defined frequency and then escalates that to a higher level if needed. It also automatically notifies all affected users when a new document, or a change to an existing one, is approved. Documentation efficiency and effectiveness is possible if documents are easily accessible and changed. An organization should be able to use its own forms and checklists in auditing management software. It should be able to input all audit types, including process, product, systems, housekeeping and/or safety. Its auditing software should man-age all auditing programs, including ISO 9001:1994, ISO 9001:2000, ISO/TS 16949:2002, ISO 14001, TL 9000, AS9100, as well as supplier audits. Effective auditing management software manages human resources, such as tracking auditor qualifications and/or certifications and auditing activities, while permitting only qualified auditors to be assigned--and to conduct--specific types of audits. It helps users easily access and manage auditing and auditor schedules. Typically, organizations follow the same cycle of audits for one quarter and then the entire year. Good software allows easy scheduling. It also tracks and reports scheduled audits that aren't made, those that are made but missed, the number of corrective actions issued, corrective action due dates, missed dates and an explanation of why a corrective action report remains open. It provides a report and visual display for this information. Then it sends out e-mail reminders to auditors and auditees at a user-defined frequency and escalates the notices if scheduled activities aren't completed in a timely fashion. Another key to effective companywide management involves data availability, visual data analysis and managing continual improvement. Consider this the payback for installing and using enterprisewide software. It provides and manages information about quality, cost, delivery and technology as well as other parameters critical to both customers and management. It makes a broad range of enterprise data--including quality, cost and delivery performance--available at the corporate level, business unit level, plant or operational level, product and service type level, even the department level. Such data availability, called drill downs, facilitates data analysis and problem solving, from failure mode-specific, to process, to systemwide. Data are available in many formats for analysis and interpretation, and certainly as trend and Pareto charts. The software easily and efficiently facilitates forming and managing teams to work on identified problems. Teams have access to tracking indicators (tools for managing the project) for process analysis and disciplined problem solving, and for creating action plans to work on enterprisewide improvement. At all levels, the entire data architecture or data management system is available for conducting management and/or review and business planning. Enterprisewide software is also concerned with continual improvement and offers more than a series of procedural lists and forms that people fill out in order to comply with a standard. The software helps build effectiveness and efficiency into processes. It's also flexible enough to fit the company's environment while helping to institutionalize best-in-class approaches and techniques. Today, many businesses still suffer from the inefficiency, delays, added cost and unreliability of redundant data entry into multiple, discrete, function-specific software packages, including documentation, auditing, calibration, quality planning, human resources and engineering. Most often this redundant data entry takes place in a variety of venues within the organization--departments, plants, business units and corporate divisions and departments. During the 1990s, Omnex helped develop and implement a QOS process for hundreds of Ford Motor Co. suppliers around the world. As typically implemented by organizations, this methodology required one week of work for data preparation and one week to hold the meeting. Thus this activity could cause a potential two week downtime in which management would have taken time away from improvement duties. Imagine the savings if an enterprisewide software system had been installed. In just a couple of hours the data would have been readily available and easy to analyze for business and operations reviews. Such timely access, available through enterprisewide software, can facilitate effective decision making and significant continual improvement. Chad Kymal is CEO of Omnex Inc., an international consulting, training and software organization specializing in business quality improvement methodologies. He is a consultant and trainer and also serves as a lead auditor for AQSR, an accredited registrar that is qualified to conduct ISO/TS 16949:2002 assessments. Kymal has served in the past two years on the Malcolm Baldrige National Quality Award Board of Examiners. He also founded Omnex Systems, which developed the 100-percent Web-based EwQMS system, including AQuA Pro, Audit Pro, BOSS, Document Pro, HR Pro, MSA Pro, Process Pro and TPM Pro. Letters to the editor regarding this article should be e-mailed to letters@qualitydigest.com.